It's a very common issue for many: male and female pattern hair loss. Dermatologists, being experts in skin, hair, and nails, treat hair loss and thinning hair daily. Current treatment options include topical minoxidil (Rogaine), vitamin supplements that contain biotin (we carry Viviscal at Premier Dermatology, MD), prescription oral medications such as finasteride, and surgical hair transplants. 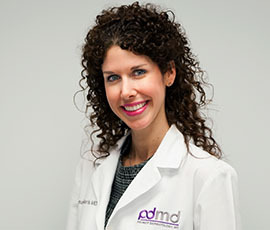 We are now pleased to offer platelet rich plasma (PRP) therapy at Premier Dermatology, MD as an additional, non-surgical option for patients who require stimulation of hair growth. Human blood contains stem cells and growth factors that assist in tissue regeneration and healing. Published medical literature from Europe and the United States confirms the safety and use of PRP therapy in other areas of medicine. It has been used for over two decades for skin and wound healing. PRP therapy has established itself to be effective as a medical treatment in the specialty fields of oral surgery, plastic and cosmetic surgery, sports medicine and orthopedics. Evidence in the literature supports PRP therapy as a promising treatment option to promote hair growth. It is not currently an FDA-approved treatment for hair growth and is not meant to replace current FDA-approved therapies. Blood is drawn in our office and then is spun in a centrifuge. The PRP, which contains platelets and growth factors, is separated and removed from the rest of the blood. The highly concentrated PRP is then injected into the scalp. There is no sedation and patients can drive themselves to and from the office. Generally, the treatments are performed monthly for four months, and then once every six months for maintenance. PRP contains special cells called platelets and multiple growth factors that can theoretically cause growth of the hair follicles by stimulating the stem cells and other cells in the hair follicle. The primary purpose of using PRP is to stimulate inactive hair follicles into an active growth phase. Individual results vary with each patient. No guarantees of success can be made but PRP preliminary studies and case reports indicate patients can respond to PRP therapy. PRP is a potential emerging, natural, non-surgical based therapy for hair follicle stimulation in thinning hair. In summary, PRP therapy offers the opportunity for an additional treatment option for those patients who are not candidates for surgery, those wanting a more aggressive non-surgical approach to treatment or to supplement currently FDA-approved treatments. To learn more about PRP therapy, schedule your consultation with Dr. Bilu Martin by calling (305) 521-8971.